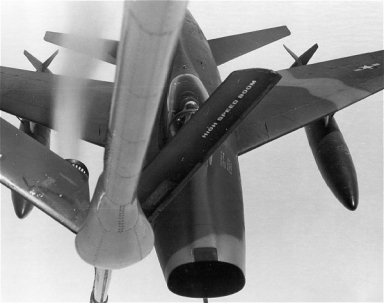 At the left is a North American F-100D Fighter/Bomber refueling off of a KC-97 tanker someplace over North America circa 1982. Picture was taken from the boomer's position. I always wondered what the boomers were doing once I got the fuel flow going after hook up! To contact us just send an email to us at N9QR@N9QR.COM or just fill out this form and we'll contact you.